A group of researchers from the United States and Israel have discovered coral bleaching in Hawaii and parts of Eilat. Considering this, the Hawaiian government has officially banned the sunscreen ingredient, Oxybenzone. 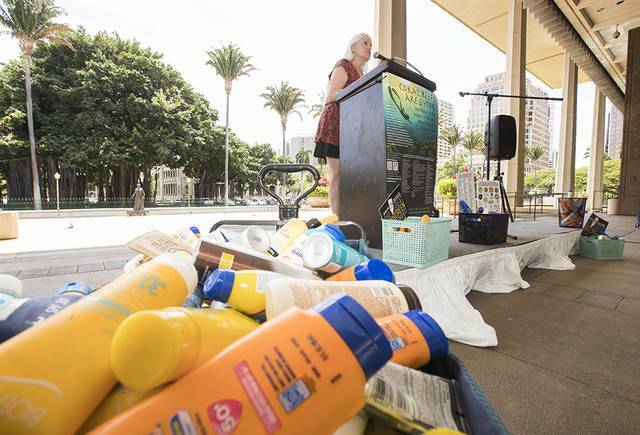 Governor Dave Ige signed a new law that sunscreens containing Oxybenzone chemicals will be banned from 2021. This is because one drop of Oxybenzone can cause the coral to fade. The European Government also tried applying the same kind of ban after the passage of the Hawaiian Bill. Oxybenzone is used in more than 3,500 personal care products and is being sold worldwide. If proper action is not taken at an early stage, there is a serious issue of coral being washed away due to the use of this chemical. The reports of a research done by the U.S and Israel were published in ‘Environmental Pollution and Toxicology Archive’ 2015, which shows that BP3 (Oxybenzone) from septic tank and municipal sewage can contaminate the coral reefs. They disrupt the endocrine and cause DNA damage, which finally leads to coral death. One of the interesting facts revealed in the research was that around 14,000 tons of sunscreen lotion was being discharged into the water bodies, which contains around 1-10% Oxybenzone. The researchers also stated that at least 10% of coral reefs are at high risk this year. One researcher from Israel added that sunscreens using benzophenone are widely being used in Israel. The researchers were happy that their study would have a good impact on the reduction of coral communities caused by chemicals, climate change, and waste runoff. Currently, Oxybenzone level in water is 12 times (800 to 1 millionth of a million) more than the coral needs.